James “Jimmy” Kirchoff passed away May 2, 2016, at the Northstar facility in Columbus. A memorial service will be held Saturday, September 3, 2016, 10:00 A.M. at Kracl Funeral Chapel in Schuyler, officiated by longtime family friend, Jerry L. Kracl. All of Jimmy’s family and friends are welcome to join us for tears and laughter as we celebrate his entry into heaven. Jimmy was born November 5, 1959, in Farmington, New Mexico. He traveled with the family to various states, following the construction trade his father had chosen. 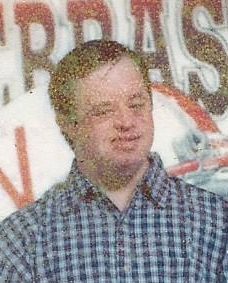 Early in life Jimmy was diagnosed with Down’s Syndrome and due to the severity of his affliction, was placed in the Beatrice State Home for a few years and eventually transferred to Northstar in Columbus. Jimmy thrived at Northstar with the incredible staff and great friends. He loved work and enjoyed music, especially “In Heaven there is no Beer” and “Ring of Fire” by Johnny Cash. Jimmy is survived by his parents, Bob and Margaret Kirchoff, Ft. Myers, Florida, sisters Deb Turner, Ft. Myers and Pam(Gary) Nieman, Manlius New York and brother Ken(Faye) Kirchoff of Bismarck, North Dakota. Also surviving are three nephews, Ken, Rob and Eric. Jimmy will be met in heaven by many friends and relatives, especially his grandmother, Lillian Shuster and niece Kristie Turner.